PM in meeting with Mike Pompeo calls on Lebanon to rein in Hezbollah or Israel will be forced to act. 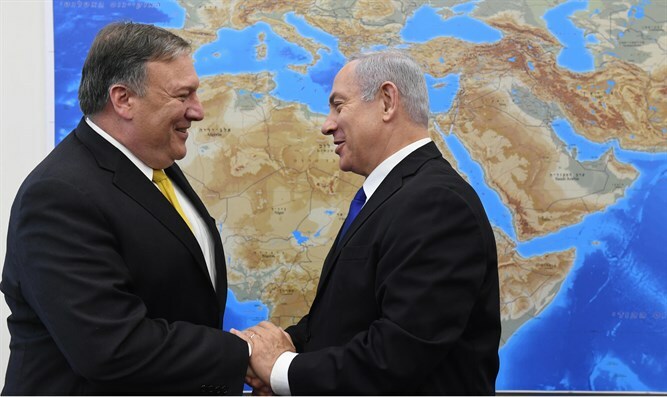 Prime Minister Benjamin Netanyahu will deliver a warning to Lebanon during his meeting on Monday evening in Brussels with US Secretary of State Mike Pompeo. According to News 2, the prime minister will warn Lebanon: "Stop the last Hezbollah operations in Lebanese territory or we will have to act." It is beliveded that Netanyahu's warning refers to specific events that recently occurred in Lebanon, and especially the establishment of precision missile factories on Lebanese soil. Hezbollah and Iran have recently been trying to bypass Israel's counterterrorism activities in Syria and to transfer the production of precision rockets directly to Lebanon while bypassing Syria. Netanyahu said in recent months that he would not allow Iranian weapons to be sent to Lebanon.